Narmadabai now just wants the murder case – which originally saw top BJP leader Amit Shah charged with complicity – to come to an end quickly. Ujjain (Madhya Pradesh): “I would rather forget the year 2006 as an unpleasant dream and believe that my son died of some ailment,” says 72-year-old Narmadabai, sitting alone in the dimly-lit room of her house in the Shantinagar slums of Ujjain. “Or even better, forget he was ever born,” she says, after a brief pause. Her son, Tulsiram Prajapati, a small-time “criminal”, was 28 when he was killed in an alleged fake encounter that year in what the Central Bureau of Investigations (CBI) calls an “interstate politician-police nexus”. But the wish to wipe out the memory is not out of any ill-feeling for her dead son but due to what she has had to endure since his murder. “With his death, he escaped this world but left me here to die every minute,” she says, her eyes welling up. Narmadabai is a complainant in her son Tulsiram’s murder case and also an important witness for the CBI, which is prosecuting the case. But 12 years after his death, when she was summoned before special CBI judge S.J. Sharma to testify last month, she refused. She refused to appear before the court even when the judge issued a non-bailable warrant against her following multiple summons. She says she has lost count of the innumerable threats she has received over the past decade. “I have lived under tremendous pressure in the past 10 years. What is the point of pursuing the case when I know no amount of trying can get my son back?” she asks. This reporter managed to get a glimpse of the kind of surveillance and intimidation Narmadabai has suffered. While she was speaking to The Wire at her home on December 4, a man in his 50s entered and began questioning us. He introduced himself as ‘Vinod Sharma’ and told this reporter he was Narmadabai’s “relative”. 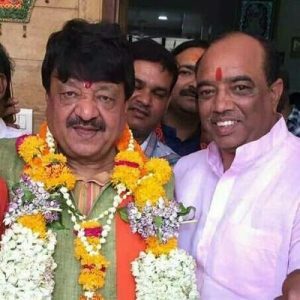 Vinod Lala (right),standing next to BJP leader Kailash Vijayvargiya. He refused to let Narmadabai continue with the interview and as this reporter began to click her pictures with her consent, the man stood in the way. “Aap photo nahi le sakte. Abh interview bandh kar do (You can’t take pictures. Stop the interview now),” he declared. As an intimidation tactic, he then began taking the reporter’s pictures and followed her until she had left the basti. The reporter later found out that ‘Vinod Sharma’ was in fact ‘Vinod Lala’, a local BJP (Daulatganj) Mandal president. His Twitter handle features a photograph of himself standing to the right of senior BJP leader Kailash Vijayvargiya. A BJP man’s sudden intervention in an interview is not unusual. Especially given that the initial chargesheet filed in the Sohrabuddin-Kausarbi-Tulsiram Prajapati murder case by the CBI had named 37 persons, which included political leaders like BJP chief Amit Shah, and Rajasthan’s ex-deputy chief minister Gulabchand Kataria, several IPS officers from Gujarat, Rajasthan and Andhra Pradesh and low-rung police officials. While all the political names and senior IPS officers were dropped from the case, the trial was conducted only against low-rung policemen. Prajapati was a key-witness to the high-profile abduction of Sohrabuddin Shaikh (also, his associate) and his wife Kausarbi, who were subsequently killed in November 2005. He was believed to be traveling in the same bus as Shaikh and Kausarbi from Hyderabad to Sangli on that fateful night. While the couple was taken away to Ahmedabad, Prajapati was handed over to the Rajasthan police and lodged at Udaipur central prison for a year. Although, a prime-witness to the abduction, he was kept alive for a full year before he was finally killed in December 2006. That one year, Narmadabai says, he suffered the most. “He was in a hell-hole, dreading every moment that he would be killed. He knew his end was pre-decided. And all that he had feared happened just as he had said it would,” she says. The prosecution’s case, which was built on the basis of Narmadabai’s statement, claims that she had met him on three occasions from the time of his arrest in November 2005 till his death, a year later in December. She says that each time she met him at the Ujjain and Dewas district court (where he was facing trial in two separate cases), he had told her, “mera counter ho jayega,” a euphemism for staged killing she did not know of until he was finally killed. “Mujhe kahan pata tha ‘counter’ ka matlab murder hota hai. Jab bhi usse milti who gidgidakar kehta mujhe bachcha do amma, mera ‘counter’ kar denge. Aakhir mein wohi hua (Where did I know that by ‘counter’ he meant he would be murdered. Each time I met him, he would desperately plead and say, Amma, save me, they are going to ‘counter’ me. He was afraid he would be killed. And he was at the end),” she tells this reporter. By the time Prajapati was killed, the heat on the Sohrabuddin matter had ratcheted up considerably. The Gujarat police had announced his killing, claiming he was on a terrorist mission to assassinate Narendra Modi. However, Sohrabuddin’s brother Rubabuddin had moved the Supreme Court seeking justice and got a sympathetic hearing. He had also filed a separate habeas corpus plea seeking to know the whereabouts of his sister-in-law Kausarbi. Narmadabai says that she too was “coaxed” into filing a case. “Those days, we had several people, from every camp approaching us. I was approached by a group of lawyers and Rubabuddin and pushed to file a case,” she says. Narmadabai says Tulsiram had drifted away when he was only 18. “He fell in bad company and by 18, he was already breaking the law. I tried to stop him, filed complaints with the local police. Instead of punishing him, they encouraged him to commit more crimes. They got their cut and that was all that they were concerned with,” she alleges, further adding that as many as 25 complaints (some FIRs and some non- cognizable complaints) are pending at the Nanakheda police station. The Wire was not able to independently confirm her claim. Prajapatis belong to the backward Kumhar caste and have traditionally been involved in pottery work. After Tulsiram, Narmadabai’s younger son Pawan too died, in 2016. Pawan was another crucial witness in the case, who the family claimed had met Tulsiram in the jail and was aware of the looming threat to his life. “He jumped into a well nearby and killed himself,” she says, staring in the direction of earthen pots strewn across the room. “Those were made by Pawan, he was a talented artisan. This is all that is left behind”.